“The belief that business aviation is purely an exclusive and luxury driven way of traveling is changing in a global basis. We see this as an increasing trend,” thinks José Eduardo Costas, Head of Sales for Pre Owned Aircraft from Embraer Executive Jets. Three quarters of the 2016 are over and we were talking how Jose Eduardo sees European business aviation market. What are the key issues facing European business aviation in 2016? The European business aviation remains the second largest regional market in the world in terms of new aircraft sales and pre-owned aircraft transactions. However, the region is taking longer to recover since the financial crisis, 8 years ago. Some of the growth fundamentals are yet to recover such as the current traffic levels, residual values of pre-owned aircraft, the economic growth and political stability perspectives. Currently, business aviation traffic in Europe is pretty much the same as last year, eastern region doing better than west and south. However, there is a good recovery track in total movements of light jets, especially under charter operations. The charter consolidation is still ongoing and hopefully will help to optimize the European fleet and increase utilization, leading to a growing opportunities for aircraft replacements and additions. There are however a good number of “pockets of growth” where GDP will increase above EU average including some countries in Central Europe. This is encouraging news for business aviation, of course. Also, we believe business aviation service models are about to reinvent their selves. Last time it happened was more than 15 years ago with major fractional ownership companies in US, mainly. The advent of new, more efficient aircraft models, new fleet management tools and services as health monitoring systems may be enablers of a new era, where fleet efficiency will be key to meet demand for shared economy driven business models. In longer term, some of the business aviation orthodoxies such as its exclusivity appeal are at a cross roads. On the other hand, the ability to deliver final user benefits such as more speed, comfort and the flexibility in reaching final pointto-point destinations, continue to leverage its value position when compared to other transportation modes, and even when compared to current airlines services in major hubs. With uncertainty in the financial markets how do you this impacting on European business aviation? Uncertainty in financial markets affects all sort of business including business aviation. However, it looks like this has become the new norm since 2008, so we believe that the industry as a whole is adapting to such condition as well as the users and customers of business aviation, translated into more judicious investment decisions, either for replacement or for acquiring new or used aircraft. At the same time, the demand of people that need to fly to a location with poor schedule services or that are not offered by commercial aviation, entices the creation of different business models. Even with uncertainty in the financial markets, the Economic growth in Europe remains stable overall at 1.9 per cent (prior-year period: 1.9 per cent). In addition, the funding sources for aircraft acquisition has remained satisfactory. We have seen new financial entities interested in entering the aircraft financing and leasing market and some of them are European. The rapid growth in the use of drones and the many purposes for which they are being used, is having a dramatic increase in the number of incidences of near misses with aircraft. How would you like to see the use of drones regulated in European airspace? We are not involved in the drone business, however, as already said before, Embraer is always in favor of initiatives to increase safety. Technology development will continue of course and, as such, it will challenge established systems and infrastructure that on its turn will need to react and adapt. The drones markets and applications are in their infancy and will have to be followed closely by regulators and associations. 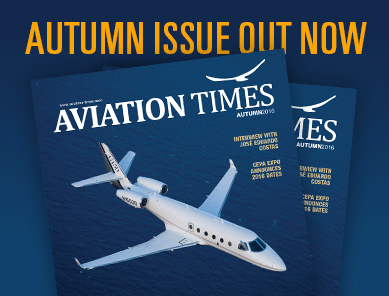 European business aviation growth has remained relatively static in recent years, what would you suggest as a solution to change this situation? The low utilization of the European bizav fleet over the last years has triggered a number of changes towards fleet “right sizing”. The belief that business aviation is purely an exclusive and luxury driven way of traveling is changing in a global basis. We see this as an increasing trend. First we see space for charter consolidation, where a reduced number of operators but with a larger fleet can rationalize admiistrative and operating costs. The next challenge is to rationalize the fleet, either because some aircraft may be too old or the new and forthcoming operational requirements will demand considerable investments depending upon the aircraft model and age. On the user side we also see a trend that the decision to fly a specific aircraft from point A to B is been taken by using internet based apps instead of traditional calls to charter companies and brokers. Technology is allowing information and decision literally at fingertips. Trip price comparisons are becoming the norm and this will likely allow a quicker and more efficient use of the fleet and then bring more opportunities for fleet growth. How do you see European business aviation in five and ten years’ time? Since business travelers are all about time savings, more and more executives and entrepreneurs will start viewing private aviation as an insurance against many service-related disruptions, common to commercial aviation services. Moreover, the price to fly a private jet is getting closer to the cost to fly in a first class. The “shared economy” phenomena will certainly lead business aviation to rediscover itself in a large scale, thus involving all of its ecosystem, from OEM´s to operators and final users. Do you believe Brexit will have an impact on European Business Aviation and if so will it be a positive or negative impact? In the short term perhaps, as uncertainty always impacts any business. UK is a very important market and will always continue to be. We expect that all the consequences of Brexit in regards to aircraft operations within Europe, aircraft taxes, etc. are all defined and understood the soonest. Having said that, we continue to have strong leads and prospects in the region even after the Brexit announcement. Share the post "Interview with José Eduardo Costas, Head of Sales for Pre Owned AC at Embraer EJ"